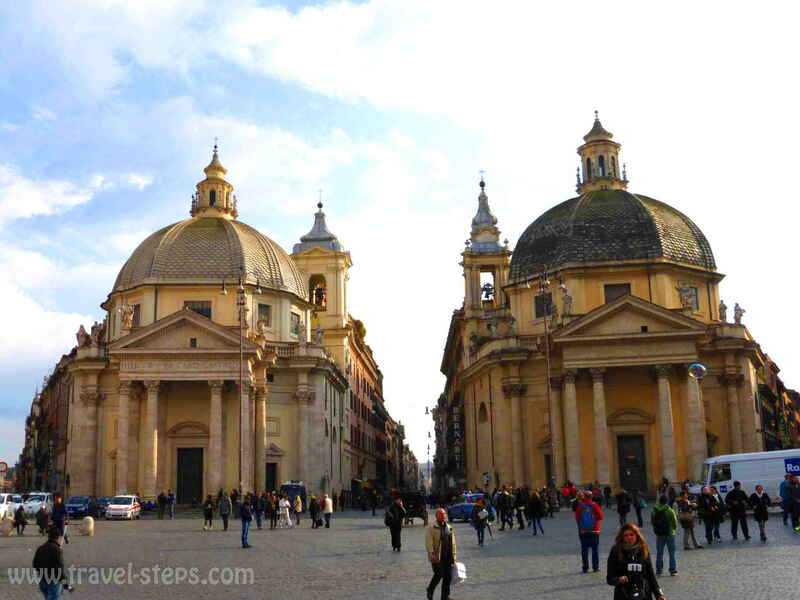 Traveling to Rome in spring or winter? Why not. Discovering the city can also be fun, when temperatures are not torturing you. As soon as the sun starts to dispel the winter clouds, the cafés in the streets are packed with people. I traveled to Rome for a 3 day weekend trip by myself in February 2015. Life in the streets never stops in Rome. 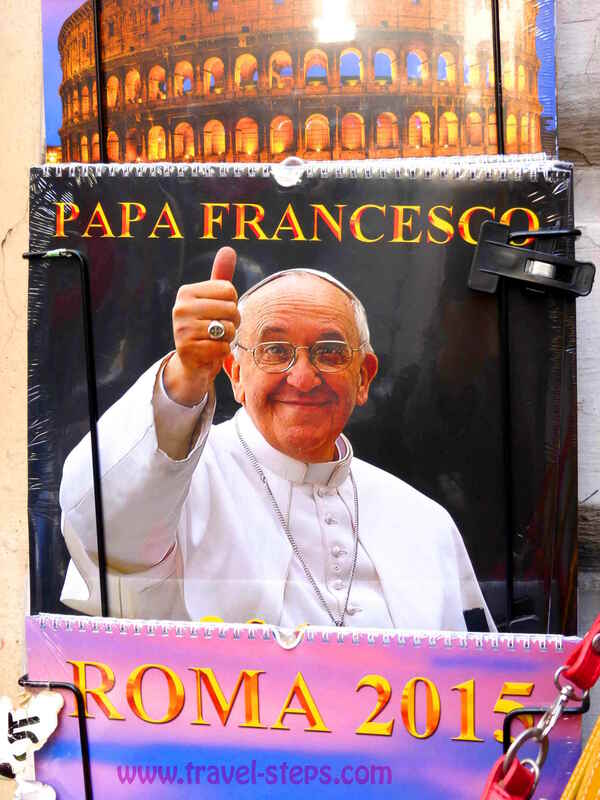 Tourist crowds are part of Rome, no matter when you go there. Rome is a magnet. Even in February, you have to wait probably two to three hours to visit the St. Peter’s Basilica. 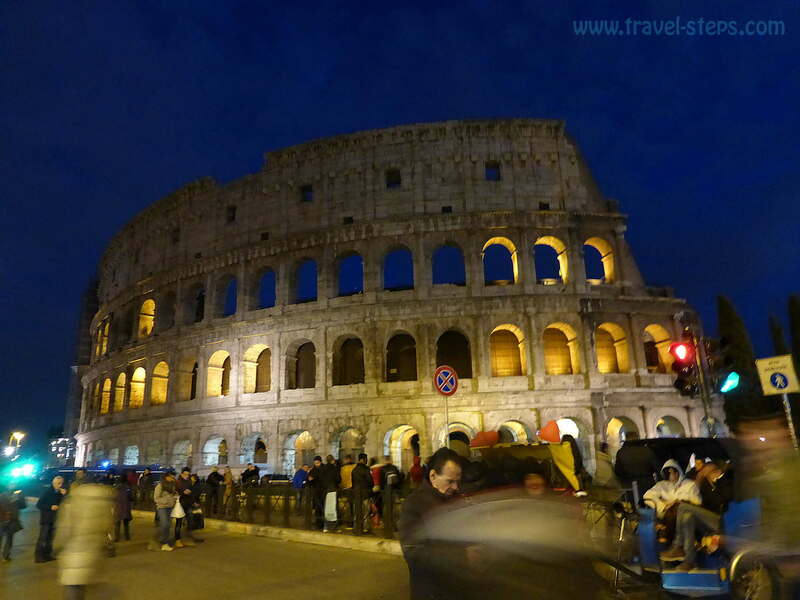 The queues in front of the Colosseum are almost always a few hundred metres long. But hey, there is free space at the Spanish stairs, where you can enjoy an ice cream while sitting among tourists from all over the world – and maybe also among some Romans. 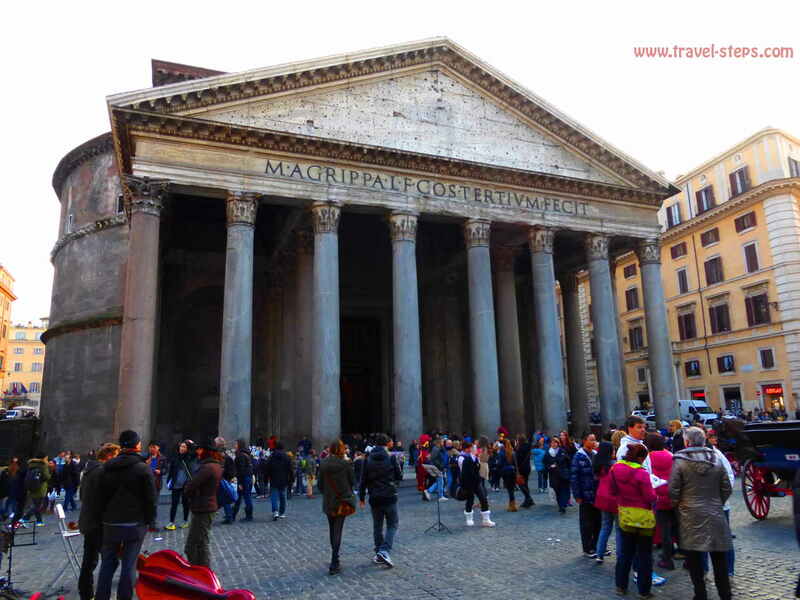 Also, if you are traveling on a tight budget, traveling to Rome in winter or spring can be an advantage as prices for accommodation can be much lower. Of course, three days are not a lot, but still enough to get an impression of Rome’s beauty. I travelled by myself and didn’t get bored for one second. I had a direct flight from Hamburg to Rome Fiumicino Airport. For advice about transport and sightseeing, the English-speaking guys at the tourist information right at the airport in Rome might help with useful information. To go from the airport to the city centre, there had been a few options. The direct train (14 Euros) is the fastest way. 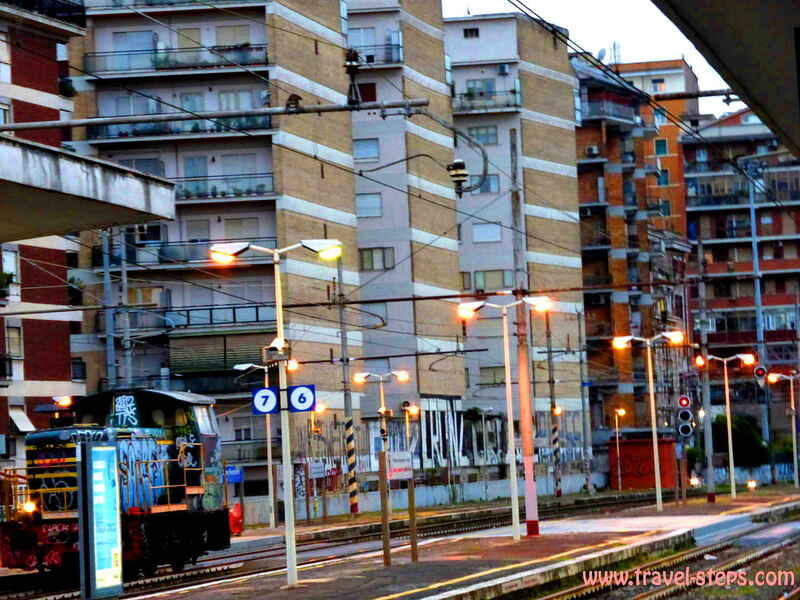 It stops at the main station (Termini), where you have access to the metro lines and other public transport. The shuttle busses are much cheaper (5 Euros, return 8 Euros). The buses to Rome city center leave the airport just a few hundred metres right from the arrival hall’s exit. You find all the information about airport transport online on the airport’s website. It took me one hour to get by bus to the main train station (Termini), but gave me a good impression of how Romans live in the suburbs. Many travelers going to Rome might have heart about the Roma Pass available to get discounts museums and free transport in Rome. It is already available at the airport in Rome. Just be aware, that the Roma Pass doesn’t include free transport from the airport to the city centre. I didn’t know that, before I arrived. Thankyou guys from the tourist information to make me think about taking the Roma Pass! By the way, on the way back from Termini Train station to Fiumicino Airport, I wanted to be very clever and listened to an adventurous guy from my hostel. He told me, that he had found a “cheap” train to go to the airport. It was just 8 Euros or so. What we had not expected: We both ended up sitting in a crowded slow train and had to change trains somewhere in a suburb. We didn’t even know that before. Both slow trains were on delay. That is why it took ages to arrive at the airport. My travel mate almost missed his flight. So, the slow trains are just recommended, if you are interested to watch Romans on the way to work in the mornings. Not for a quick arrival. 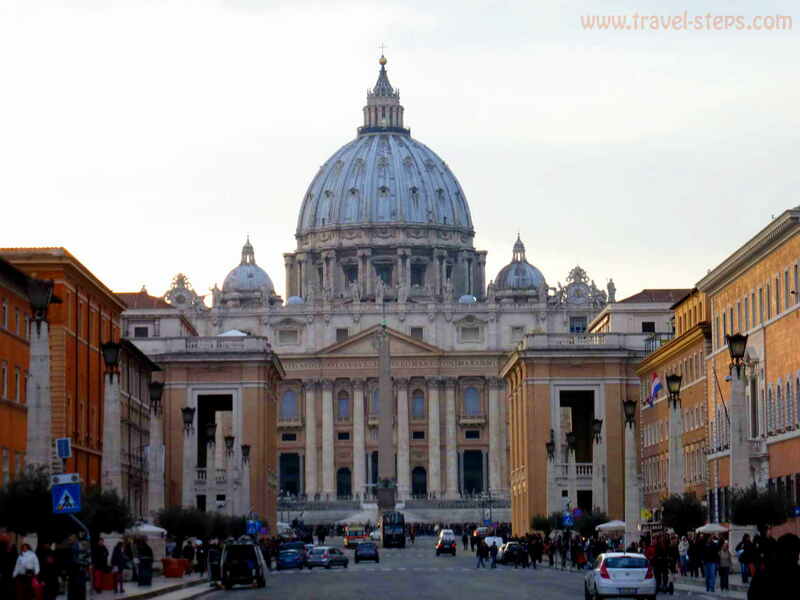 For short trip to Rome on a budget, it makes sense to choose an accommodation close to the main train station (Termini), because you have a choice of budget accommodation, are able to go to the airport quickly and to walk to a lot of sights. I was able to get a bed in a dorm in a hostel for 10 Euros per night in the hostel and hotel “Des Artistes”. It is recommended to book accommodation in advance even in winter as Rome can get very busy. 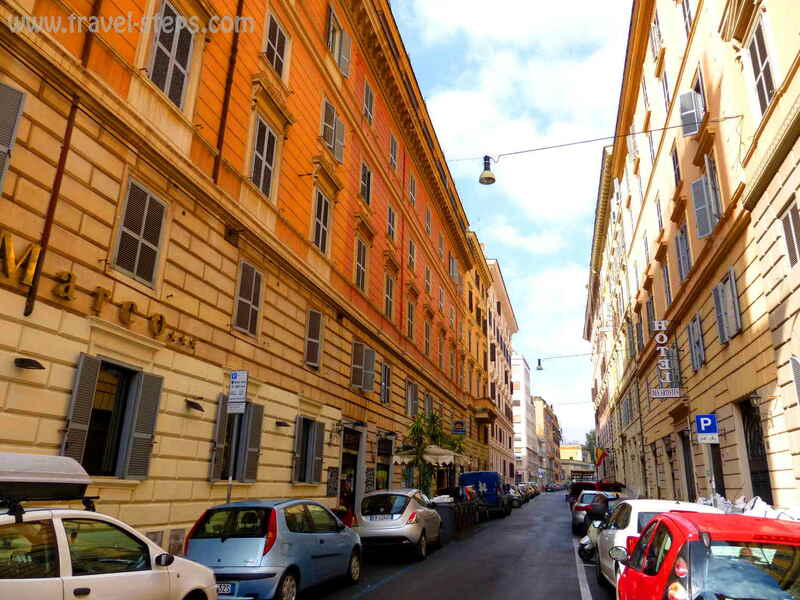 Before I was traveling to Rome on a budget, I was looking for a social and backpacker friendly accommodation online. My idea was to be able to meet fellow travelers in a hostel. But I didn’t find it. Rome doesn’t seem to be prepared for solo travelers in that way. I was still lucky. In my hostel, I met by chance some nice solo travelers from different continents, who stayed in the same dorm. An Italian friend warned me beforehand not to stay in that area around Termini station. He said something like “There are junkies walking around with needles in their arms”, with turned out not to be true at all. The area between the metro stations Termini and Castro Pretorio was a very nice part with some foreign embassies in the neighborhood, small cheap pizza restaurants (mains under 10 Euros) and a supermarket in walking distance. It’s probably not the place to be, if you wanna go out and party though. But it is perfectly alright to use it as a base for city sightseeing. The Roma Pass is available for 36 Euros. It sounded like a good deal for me at first, because it offers free public transport for three days, free entry to the Colosseum and free or reduced entry to museums, galleries and archeological sites. Read more about the Roma Pass here. To buy the Roma Pass doesn’t make sense to everybody. Many people don’t even use the metro. It is amazing to discover Rome on foot. A ride with metro or busses just costs 1,50 Euros per trip, a day ticket 6 Euros. The Colosseum including Forum Romanum and Palatin is 12 Euros. Moreover, not all the museums offer free entry with the card. And the transport to or from the airport is not included, neither is the entrance fee of the museums of the Vatican. And honestly: Do you really want to spend three days just in museums? One big advantage of the Roma Pass is, that you don’t need to queue for the Colosseum, but can enter the historical site straight away. But there are also other ways to get in faster. I didn’t take the Roma Pass and was happy with my decision. I was impressed so much with what I saw just by walking around the city and wouldn’t have had the time to visit a lot of museums during three days. Be clever! Don’t queue at Colosseum, Forum Romanum, Palatin! 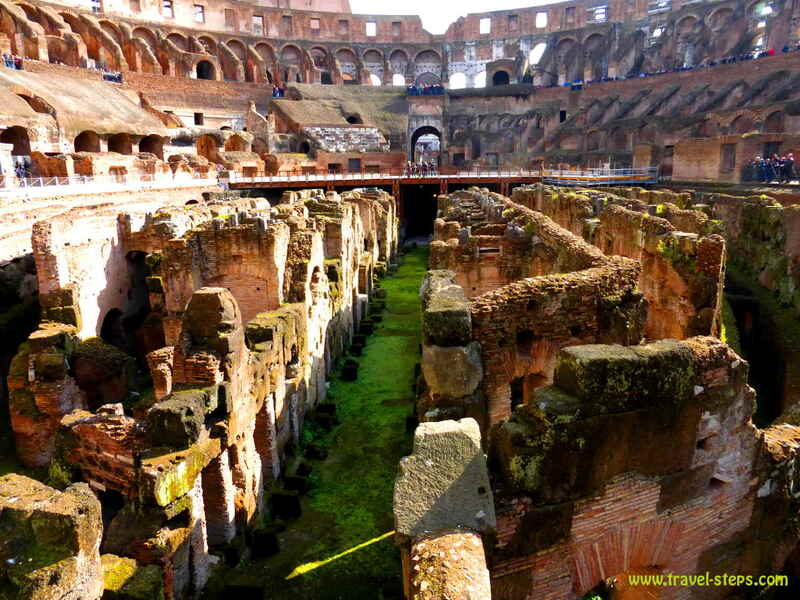 The Colosseum is a must see for almost every tourist in Rome. At least from the outside. It has its own metro station and is therefore easy to reach for even the most disoriented tourists. The entrance fee is 12 Euros. Included in the fee are also the Forum Romanum and the Palatin. Get up early to visit the Colosseum or use other options! You have two days to visit each monument or historic site once. As even Turismoroma, the city’s tourist portal in the Web states: „It may be two thousand years old but the Colosseum is still the symbol of the eternal city, every year drawing thousands of visitors, meaning long queues and an endless wait.” So, it is a good idea to go early in the morning. The Colosseum opens at 8.30 am. The closing time differs depending on the season. But it will be open at least until 4.30 pm from end of October to the 15th of February. 1. Get your Closseum-ticket at Forum Romanum or the Palatin! Whoever starts feeling sick with the idea of waiting around for hours and wants walk by all the waiting people, can try some other options: Ttry not to use the main entrance to buy your ticket, which is by far the most busy entrance. As also the Forum Romanum and the Palatin are included in the entrance fee, you might as well buy the ticket for the Colosseum there and safe some time. There is just one ticket for all three sights. The ticket is valid for 2 days. Look for the other entrances, which are just a few hundred meters away) at the map or ask around.Forum Romanum: Largo della Salara Vecchia, Palatin: Via di San Gregorio. 2. Book your ticket online! 3. Get the Roma pass! It can happen, that you still have to wait. In February, around 9 am, I had to queue for almost one hour to buy the ticket at the Forum Romanum, but went to see the Colosseum first with this ticket and was able to walk past all the people waiting. And there are a lot of people, even in February. Once in the Colosseum, you can easily spend more than one hour there. There is a little exhibition in the upper floor, that helps getting an impression about the life in the Colosseum in former times. Otherwise, use your imagination, take part in a guided tour or use the audio guide. To be honest, I didn’t think, that it was all self-explaining, so I wished afterwards, I had taken at least the audio guide. It probably depends on how much knowledge you already have about how everything in this Colosseum worked. I also enjoyed the amazing view from the Palatin hill afterwards and walking through the impressive Forum Romanum. I needed roughly half a day to visit all three places. I went to Rome in February. The sun was shining and putting me in a good mood. I got a map and started walking around the city to get a feel for the atmosphere. You can walk around for hours of getting tired watching the architecture, the little shops in the streets, to discover the churches and the Italian way of life. But as soon as I got to the main sights, I got reminded, that I was a tourist meeting hundreds of other tourists. Still nice to see the impressive Trevi Fountain, although it was under construction during my visit in February 2015. Hundreds of tourists have been guided over a little bridge like sheep. In November 2015, it was open again. If you are up for an expensive meal among tourists, there are waiting a lot of restaurants. 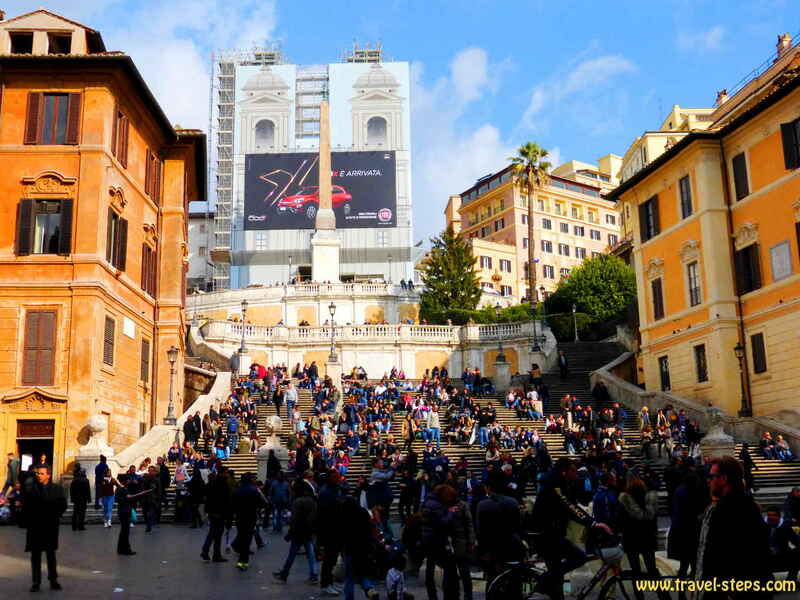 I enjoyed sitting down at the Spanish Steps, although there had been construction works at the„Piazza di Spagna“. Well, I coudn’t see any Italians, that try to flirt with ladies as my travel guidebook was telling me. But I still enjoyed the vibe, walked around the nearby streets full of beautiful representative buildings, boutiques and cafés with their outside tables. Fashionably dressed Romans walk along the busy streets. And also in February, the ice cream shops were open and more than worth a stop. There was a sign saying, that eating on the Spanish stairs is not allowed. But no one gave me a fine for eating ice cream there. 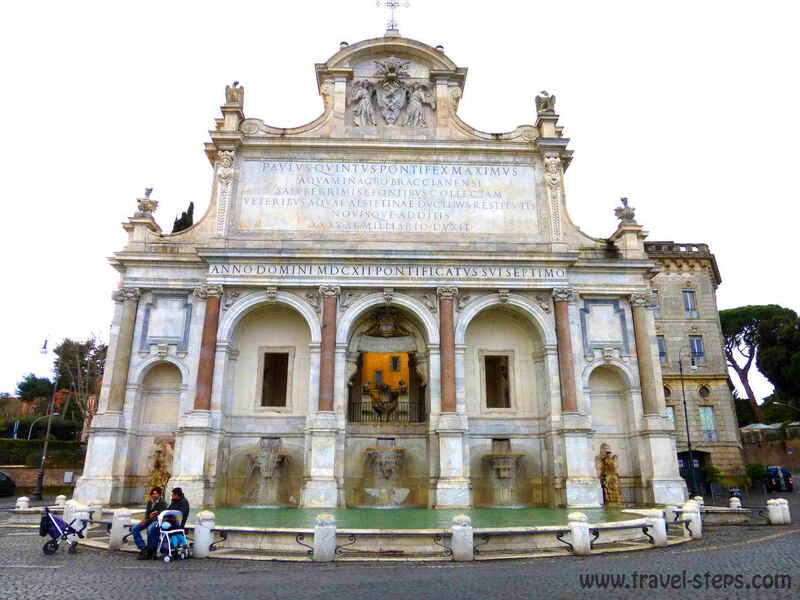 It is worth discovering the Piazza del Popolo with its 36 meters high obelisk. From there, you can walk up quickly the Pincio hill and enjoy the view on Piazza del Popolo and some parts of Rome while listening to street musicians, that are more or less entertaining. 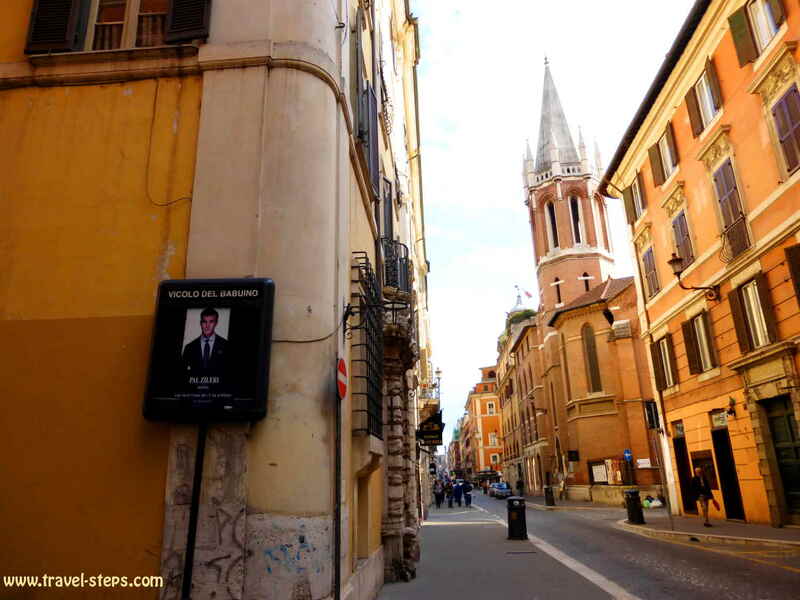 If you are lucky and get there at the right time, you can visit the twin churches built in the 17th century, the Chiesa Santa Maria die Miracoli and the Chiesa Santa Maria in Montesanto as well as the renaissance church Chiesa di Santa Maria del Popolo, in which a few famous artists left their traces. The entry to all these churches is free, but there are unfortunately closed around noon and open again in late afternoon hours. 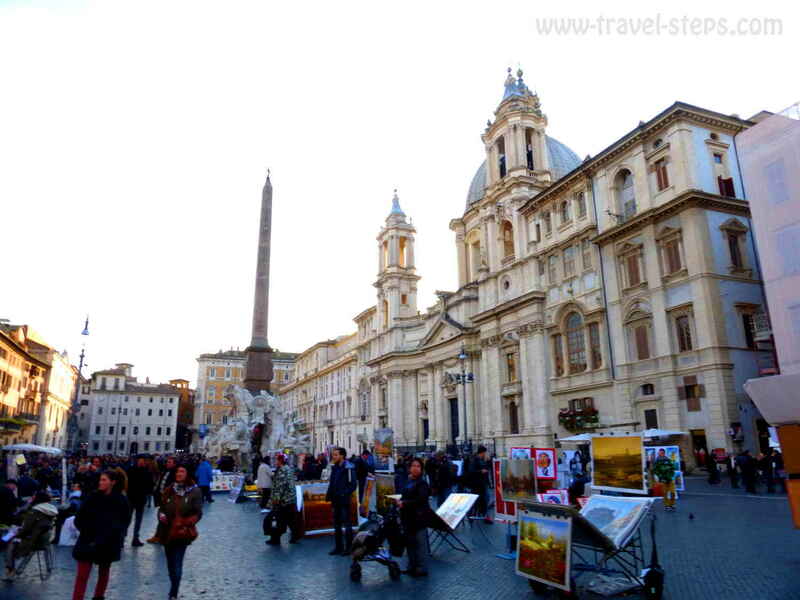 It is said to be one of the most beautiful places in Rome: the Piazza Navona. At least, there are a lot of tourists there for this reason. Street artist create soap bubbles, Indian looking “magicians” seem to hover above the ground and love to get photographed in exchange for a few coins. If you haven’t bought a selfie stick for your camera till then, you will have again the opportunity – as a million times before. And don’t worry if it rains: as soon as the first drops fall, you will get offered cheap umbrellas everywhere. But I spite of a little hassle, the seats in the cafés on Piazza Navona will be packed with people. Some travelers might hang out on benches and prepare baguettes from the supermarket while the colorful activities are going on. It is fun to watch people there. Markets of all kinds are taking place in Rome especially in the mornings or also during the days. 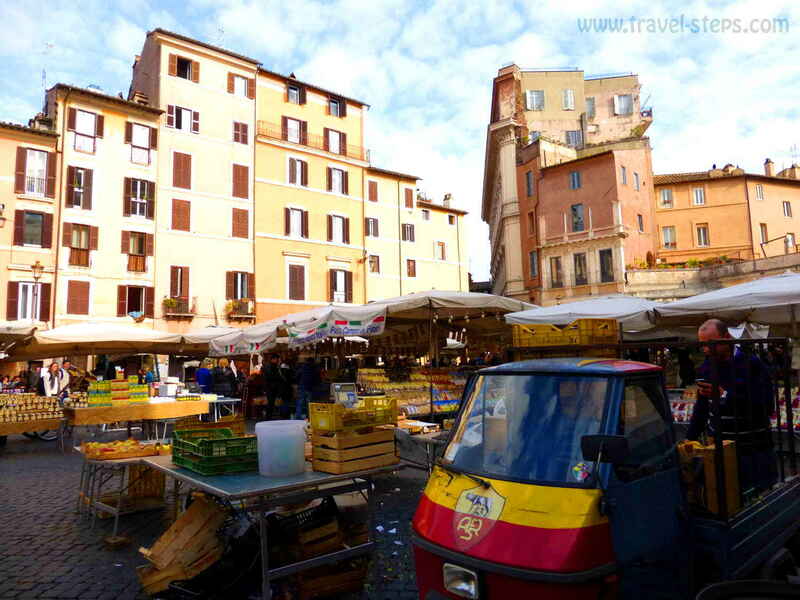 One, that gets mentioned in many guidebooks is the Campo de Fiori as it offers goods especially for tourists. 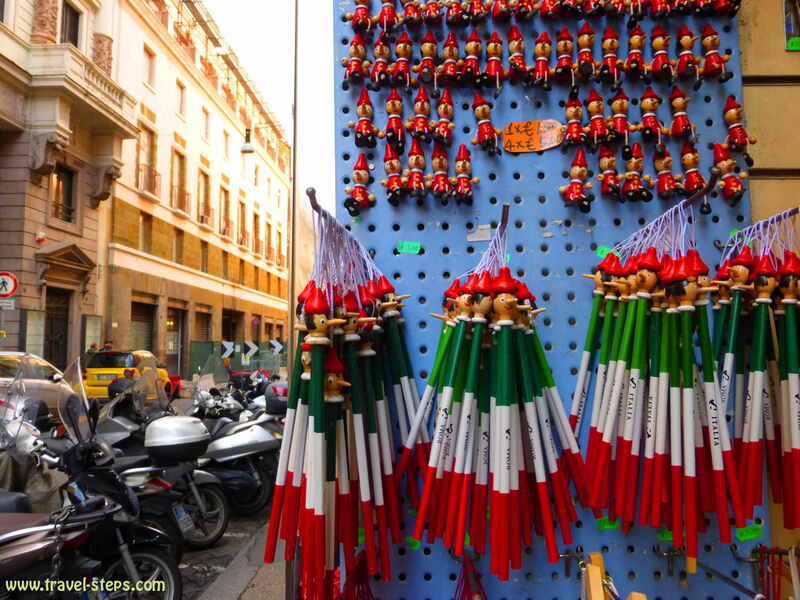 Nicely decorated pasta or pesto are sold as souvenirs. Fresh juices, fruits or typical products can be bought. If you need a T-shirt with “I love Rome” printed on it, this is the place to be. You can get snacks, pizza or ice cream at nearby shops. The atmosphere is lively. But you won’t need longer than 15 minutes to get an overview about the market stalls. It’s for free, one of Rome’s most famous sights and worth a visit. The temple is 2000 years old. Thinking about the age and the good condition of the monument, to catch a glimpse of its interior can make you feel respectfully small. The official website of Tourism in Rome might help to get an overview of the main sights, although not every description is translated into English. 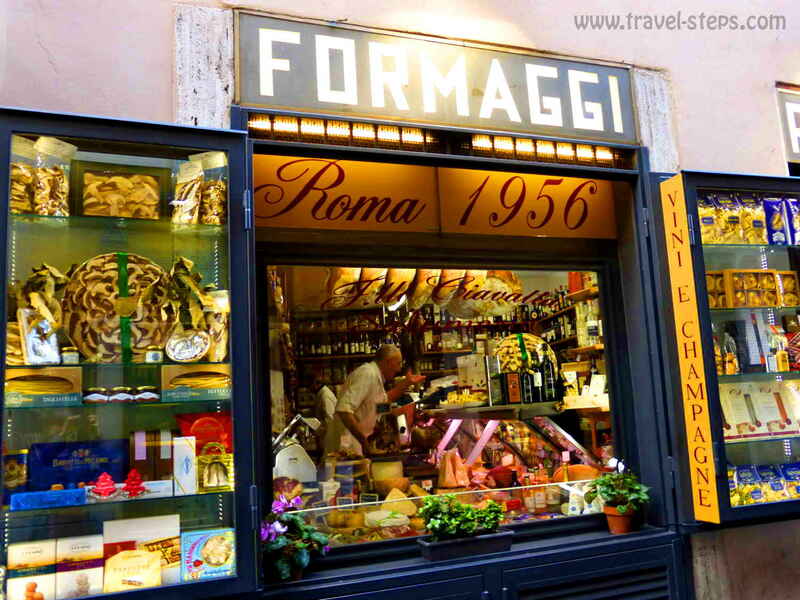 You will probably not have to fear staying hungry in Rome. There are probably hundreds of shops in the center, where you buy a slice of Pizza to go. You can choose between different toppings and how big your snack should be. It can be a great way of discovering the great variety of pizza toppings. Usually, you pay by weight for example per hundred gram. Depending on where the shop is located (close to main sights or not), prices per hundred gram vary a lot.It seems to be cheap. But I seriously managed to order a perfectly big slice with colorful vegetarian topping and ended up paying almost double the price than for a whole pizza in a restaurant. After a few kilometers of sightseeing walk and a lot of new impressions, you might be ready for dinner. A lot of people say, that Rome is expensive. But it doesn’t have to be. It is worth checking the blackboards in front of the restaurants, where you can often find special deals of the day. 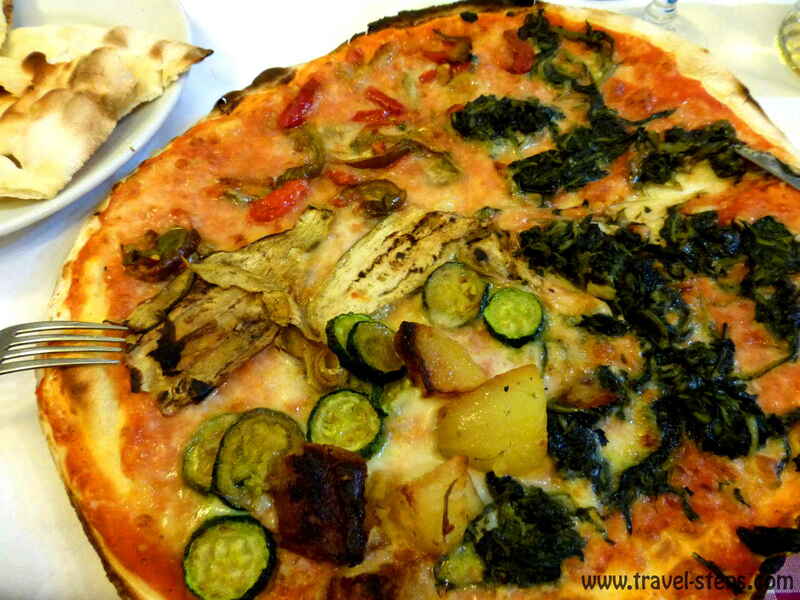 It also makes sense to try some small trattorias away from the main tourist attractions, where the Romans go. Some places don’t even have a menu. The chef will simply fulfill your dreams or at least is trying to. I found places like this also in the area around my hostel in the streets between Termini station and Castro Pretorio. You could get pizzas and pasta dishes for less than 10 Euros. If you travel alone and wanna skip the part, where you sit alone at a table, there are also Italian fast food options as for example Lasagnam in the street Via Nazionale. Instead of burgers, you get pasta dishes. No culinary adventure, but nothing to be afraid of. For breakfast pizza and bakery goods, fresh fruits, juices or some olives and bread, you can also try the supermarket and have a picnic in front of some main sights. So bring spoon, fork and knife just in case, you plan to safe some money this way. Some people might watch, other will envy you. You won’t be the only traveler doing this. I enjoyed it a lot taking out my picnic early in the morning with a wonderful Colosseum view. In front of St. Peter’s Basilica, you can spot people from all over the world queuing to get in. Who really wants to try it usually needs to be patient for a few hours as queues as shockingly long. You can probably use the waiting time to write postcards as one branch of the very reliable Vatican post office is located in the middle of the square selling postcards and stamps even at weekends. You can post your cards straight away. 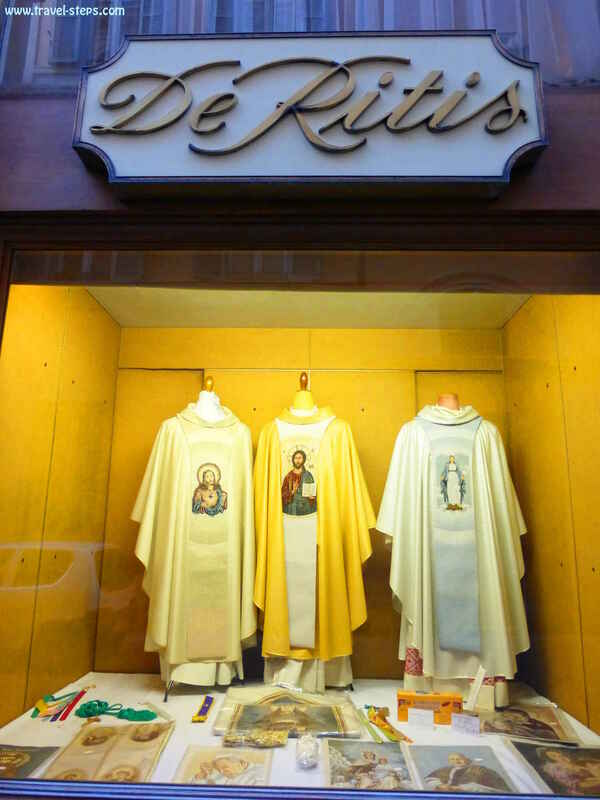 Nearby shops are selling souvenirs for believers and non believers. Walking by nuns and monks spread a holy atmosphere. Whether you are a believer or not, it is a very special unique beautiful place to visit, even with the tourist crowds around. Well, if you hate places, where crowds of people hang around, better skip Rome altogether. Visit the holy mass in the Vatican on Sundays – be early! Tourists, who stayed at my hostel, have visited the holy mass on Sunday in the Vatican. They started queuing at 7.30 am to be able to find a seat in the church for the mass starting at 10 am. Anyway, the mass will be shown on big screens outside in front of the cathedral. At noon, the Pope (if in town) usually shows up on a balcony of the upper floors of the building to bless the crowd. People were stunned, waving placards, when a man, dressed in white showed up on the balcony after the holy mass. I couldn’t tell, if it really was the pope, because he was to far away to get recognized without binoculars. The crowd felt blessed, applauded. I guess, that it is part of the sightseeing program in Rome. And the whole spectacle put me somehow in a good mood. After we all had seen probably the Pope, people had to wait till 2 pm to get inside the church for sightseeing purposes. I went there three times during the weekend and always gave up queuing after 30 minutes. It’s just not my style. I am not patient enough for that. 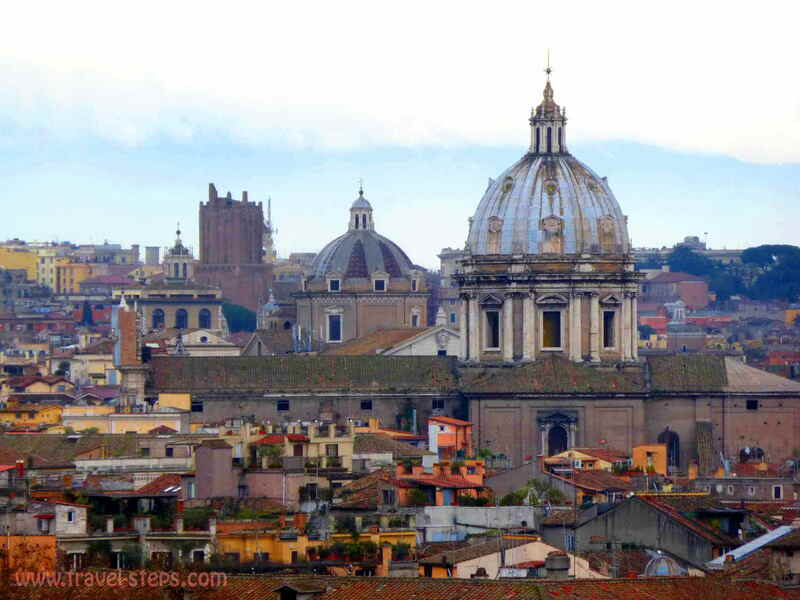 If you are around the Vatican or if you decide to leave the queue to itself and rather do the Vatican sightseeing trip on youtube.com, you still might want to enjoy the stunning view from nearby Gianicolo hill. Just walk a few meters uphill and get a fantastic reward: Watch the winter sun above the city, the mountains in the background covered with snow and in between the city of Rome. There are benches waiting for visitors. And you can already guess, that there is a lot of stuff happening in summer. 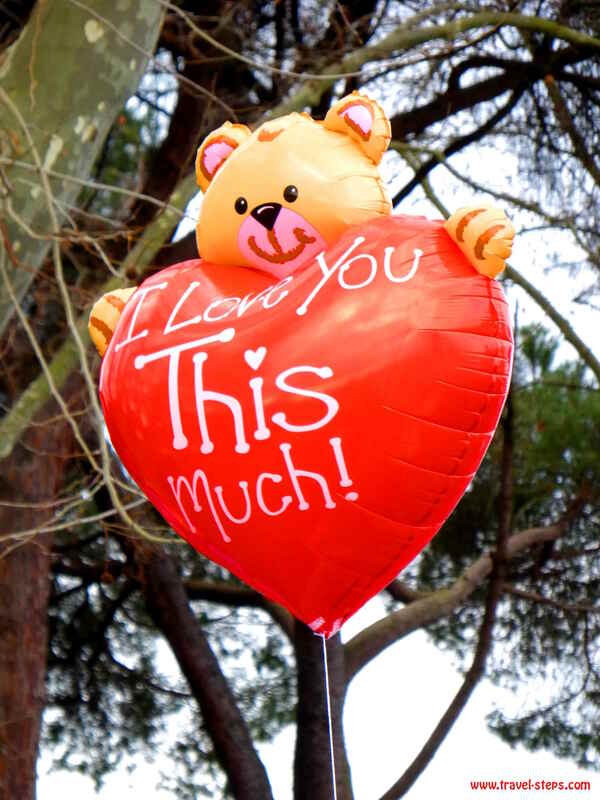 There are guys selling balloons. The way leads through beautiful gardens, past white statues and a beautiful fountain. The botanical gardens are not far. 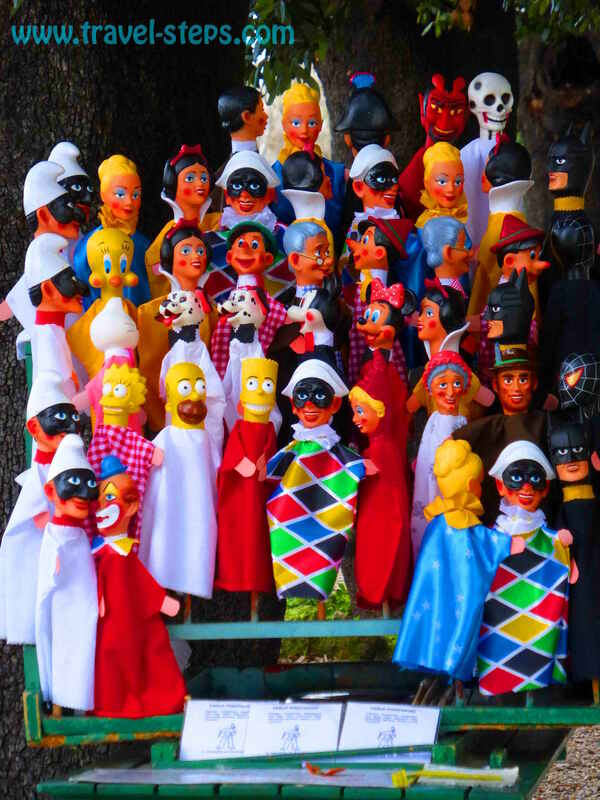 There is a puppet theatre located among the trees. Some beautiful villas inspire imagination, a carousel the kids. The whole atmosphere reminds of an old secret fairground, that invites you to catch a glimpse of a different wonderland world of former times. I followed the path leading to the Trastevere quarter. The walk put a big smile o my face. Trastevere’s colorful buildings housing little cafés and restaurants are worth a little stopover and stroll afterwards. 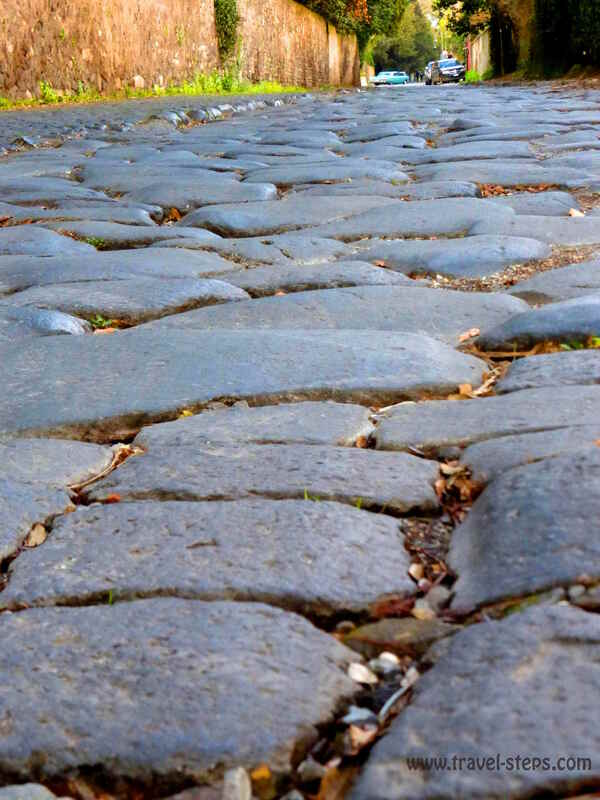 Still existing today, the cobbled street Via Appia Antica, a trading route in ancient Rome still attracts some travelers. 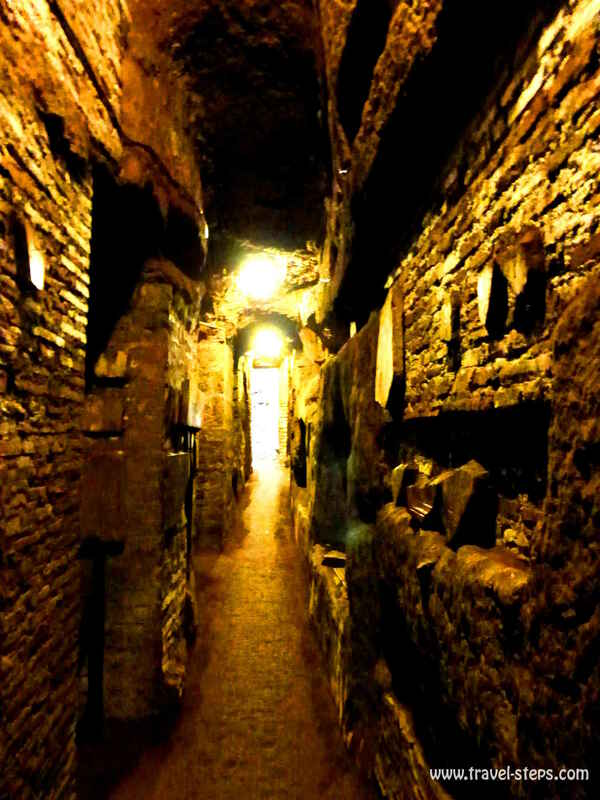 Close to the road, you can visit Rome’s famous catacombs, the Christian graveyards dating back to the 2nd century. It is basically a few kilometers long network of tunnels with graves inside the walls. The most famous catacombs are called San Calisto, San Sebastiano and St. Domitilla. The entrances of the catabombs are a few hundred meters or kilometers away from each other. And coaches carry busloads of international tourists in tour groups to the catacombs. Still, they are interesting and some of the tour guides do a very good job in presenting fascinating details of the sights. I was really exited going underground. And even if there are so many visitors, the German monk, that guided our group, put a great effort in sharing his knowledge. To get to the San Calisto and St. Domitilla catacombs, you can use bus 218, which departs at Piazza S. Giovanni in Laterano. A big group of tourists was already waiting, when I arrived. The bus was late, doesn’t go very often and needs more than half an hour to take people to the catacombs. When I wanted to go back around 5 pm, I had to wait for one hour for the bus to the city center of Rome. There were 40 more people waiting. A lot of people started getting grumpy or stopping taxis.Via Appia is just a few hundred meters away from the catacombs. Just ask the staff in the catacombs for directions as signs are rare. You can walk on the historic street, where you can also find some little garden cafés an restaurants. You get the feeling to calm down and leave the busy city of Rome for a few moments behind. At least in winter, you probably don’t meet a lot of people there. Rome is a wonderful place with beautiful buildings, fascinating monuments and great pizza. It’s a city, where you definitely don’t get bored at all. But don’t believe, that you will be unique as a tourist. Not even in winter. You need to share the magic, the space, the views and the sun. But of course, there is enough of it for everyone plus excellent pizza and ice cream. Definitely worth going for a weekend or longer. But you need to like a lot of people around you and not to be afraid of adventurous traffic. Have fun. Enjoy.